We are calling today "Song Saturday"! Today we are bringing you a fresh song about how we can be sentimental about jewelry; even after someone is gone form our life... 24-year-old songwriter Lauv sings about wearing a special piece of jewelry to preserve the memories of a love that got away in his 2018 release, "Bracelet." In this very personal song that draws on his experiences as a music tech major at New York University, Lauv (whose birth name is Ari Leff) describes a bad breakup that left him with a bracelet and a wounded heart. Later in the song, he wonders out loud whether he should "toss" the bracelet because he doesn't want to keep her figuratively wrapped around his wrist. But, the answer is always "No." The bracelet preserves the memory of their love and he wakes up each morning missing her even more. Ari was born in San Francisco in 1994. His mother was of Latvian descent, so to honor her he took on the stage name "Lauv," which mean "lion" in Latvian. Not coincidentally, Lauv's given name, "Ari," means "lion" in Hebrew. His zodiac sign is Leo. Lauv's interest in music began at an early age, Lauv took piano and viola lessons before favoring the guitar at the age of 11. He played in several bands in high school and eventually enrolled at NYU as a music technology major. 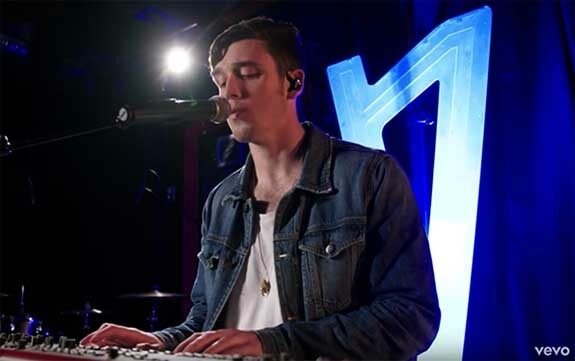 Lauv's music writing style was heavily influenced by a Paul Simon interview, during which the legendary singer songwriter revealed why, as an artist, it is important to get in touch with one's innermost feelings. A tearful breakup in 2014 set Lauv's creative juices flowing. Upon graduation, Lauv was signed by a publishing company; Prescription Songs. In 2015, he released his debut EP, Lost in the Light. By 2017, he was touring with Ed Sheeran.